Please refer to our stock # 3289 when inquiring. 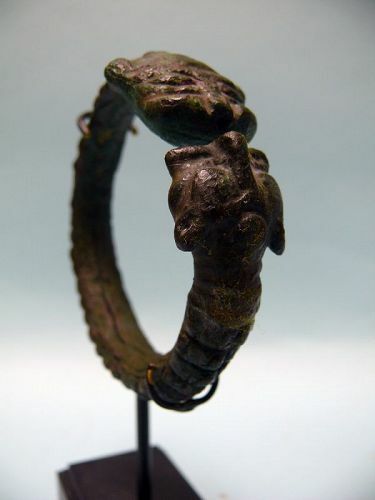 Islamic Bronze Bracelet of Two Lion Heads, 12th - 13th Century, Iran. 3 1/4" diameter, and 6" on custom stand. Some loss due to age and use. Otherwise in excellent condition. Ex: S. Beiner collection, Florida. Medieval Islamic metalwork offers a complete contrast to its European equivalent, which is dominated by modelled figures and brightly coloured decoration in enamel, some pieces entirely in precious metals. In contrast surviving Islamic metalwork consists of practical objects mostly in brass, bronze, and steel, with simple, but often monumental, shapes, and surfaces highly decorated with dense decoration in a variety of techniques, but colour mostly restricted to inlays of gold, silver, copper or black niello. The most abundant survivals from medieval periods are fine brass objects, handsome enough to preserve, but not valuable enough to be melted down. The abundant local sources of zinc compared to tin explains the rarity of bronze. Household items, such as ewers or water pitchers, were made of one or more pieces of sheet brass soldered together and subsequently worked and inlaid.